There are four more matches left to play before the world of handball will know the winners of the Women's EHF Champions League 2016/17. However, on the eve of the TIPPMIX EHF FINAL4 2017 in Budapest nine players and one coach can already celebrate as they have been named All-stars of the current season. For the first time, the All-star Team has been presented by Women's EHF Champions League premium sponsor UNIQA. Fans, media and a jury of five top coaches were asked to submit their votes for the Women's EHF Champions League All-star Team presented by UNIQA, with their combined votes counting one third each for the final result. 25,000 fans participated in the voting and 700 journalists took part. The five top coaches asked to submit their vote were Norway women's team head coach Thorir Hergeirsson, Russia women's team head coach Evgeny Trefilov, Netherlands women's team head coach Helle Thomsen, Hungary women's team head coach and former head coach of EHF Champions League winners CSM Bucuresti, Kim Rasmussen, and former Slovenia women's team head coach Marta Bon. 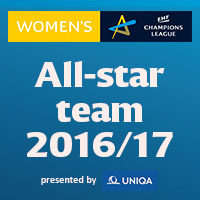 This is the Women's EHF Champions League All-star team 2016/17 presented by UNIQA. Apart from Larvik's Marit Malm Frafjord and FTC's Blanka Biro, eight All-stars will take to the court at the TIPPMIX EHF FINAL4 which throws off in the Papp László Budapest Sportaréna on 6/7 May 2017. In the first semi-final on Saturday at 15:15 hrs, 2015 winners Buducnost face the 2014 champions Györi Audi ETO KC. At 17:45 hrs the defending champions CSM Bucuresti take to the court against HC Vardar, the bronze medallists from 2014, 2015 and 2016. The 3/4 Placement Match and the final take place on Sunday 7 May and also throw off at 15:15 hrs and 17:45 hrs respectively.